Figure 1. Treatment of MCF7 cells with IGF-1 stimulates phosphorylation of Akt at Ser473 but does not affect the level of total Akt1. The relationship between lysate protein concentration from untreated and IGF-1-treated MCF7 cells and the absorbance at 450 nm using the FastScan™ Total Akt1 ELISA Kit #15942 is shown in the upper figure. The corresponding western blots using Akt1 antibody (left panel) and phospho-Akt (Ser473) antibody (right panel) are shown in the lower figure. After serum starvation, MCF7 cells were treated with 100 ng/ml IGF-1 #8917 for 5 minutes at 37°C and then lysed. NOTE: Prepare solutions with deionized/purified water or equivalent. Prepare only as much reagent as needed on the day of the experiment. FastScan™ ELISA Microwell Strip Plate, 96 well (#53257): Bring all to room temperature before opening bag/use. Unused microwell strips should be returned to the original re-sealable bag containing the desiccant pack and stored at 4°C. 1X ELISA Wash Buffer: Prepare by diluting ELISA Wash Buffer (20X) (included in each kit) to 1X with deionized water. 1X Cell Extraction Buffer: Prepare by diluting FastScan™ ELISA Cell Extraction Buffer (5X) #69905 and FastScan™ ELISA Cell Extraction Enhancer Solution (50X) #25243* to 1X with deionized water. This buffer can be stored at 4°C for short-term use (1-2 weeks). To make 10 mL 1X Cell Extraction Buffer, combine 7.8 mL deionized water, 2 mL FastScan™ ELISA Cell Extraction Buffer (5X), and 200 μL FastScan™ ELISA Cell Extraction Enhancer Solution (50X). Alternatively, Enhancer Solution may be added to the Cell Extraction Buffer after extraction of cells or tissue. When using the 1X Cell Extraction Buffer as a sample diluent for the assay, it is recommended to equilibrate it to room temperature prior to use. *IMPORTANT: The provided FastScan™ ELISA Cell Extraction Enhancer Solution (50X) may precipitate when stored at 4°C. To dissolve, warm briefly at 37°C and mix gently. The FastScan™ ELISA Cell Extraction Enhancer Solution (50X) can be stored at room temperature to avoid precipitation. NOTE: The 1X Cell Extraction Buffer contains phosphatase inhibitors. Protease inhibitors should be added to the 1X Cell Extraction Buffer immediately prior to lysing cells. Additional phosphatase inhibitors can also be added (e.g. Protease/Phosphatase Inhibitor Cocktail (100X) #5872, not supplied). FastScan™ ELISA Capture Antibody Diluent: Green diluent for reconstitution of the Capture Antibody. FastScan™ ELISA HRP Antibody Diluent: Diluent (amber bottle) for reconstitution of the HRP-linked Antibody. Protect from light. 4X Capture Antibody: Reconstitute lyophilized Capture Antibody (green colored cake) with 3 mL FastScan™ ELISA Capture Antibody Diluent (green diluent). Incubate at room temperature for 5 min with occasional gentle mixing to fully reconstitute. For best results, use immediately following antibody reconstitution. Unused reconstituted 4X Capture Antibody may be stored for up to 4 weeks at 4°C, although there may be some loss of signal compared to freshly reconstituted antibody. 4X HRP-linked Antibody: Reconstitute lyophilized HRP-linked Antibody (red colored cake) with 3 mL FastScan™ ELISA HRP Antibody Diluent. Incubate at room temperature for 5 min with occasional gentle mixing to fully reconstitute. For best results, use immediately following antibody reconstitution. Unused reconstituted 4X HRP-linked Antibody may be stored for up to 4 weeks at 4°C protected from light, although there may be some loss of signal compared to freshly reconstituted antibody. Antibody Cocktail: Combine equal volumes of the reconstituted 4X Capture and 4X HRP-linked Antibodies immediately prior to assay and mix. To make 6 mL of the Antibody Cocktail (enough for 1x 96-well plate), combine 3 mL 4X Capture Antibody with 3 mL 4X HRP-linked Antibody. Positive Control: Reconstitute 1 vial of lyophilized Positive Control by adding 250 μL deionized water. Mix thoroughly and gently, hold at room temperature for 1 minute and then follow the steps outlined below in the "Test Procedure" section. Positive Controls are recommended to be used immediately after reconstituting in deionized water, however remaining material may be stored at -80°C (there may be some loss of the positive control signal if freeze/thawed). Positive Controls are supplied as a control reagent, not as an absolute quantitation measure. TMB Substrate (#7004): Bring to room temperature before use. STOP Solution (#7002): Bring to room temperature before use. Aspirate media when the culture reaches 80-90% confluence. Remove PBS and add 0.5 mL ice-cold 1X Cell Extraction Buffer (recommended to supplement with protease inhibitors and additional phosphatase inhibitors as needed) to each plate (10 cm diameter) and incubate the plate on ice for 5 min. Microcentrifuge for 5 min (x14,000 rpm) at 4°C and transfer the supernatant to a new tube. The supernatant is the cell lysate. Store at −80°C in single-use aliquots. Remove media by low speed centrifugation (~1200 rpm) when the culture reaches 0.5-1.0 x 106 viable cells/ml. Wash once with ice-cold 1X PBS. Cells harvested from 50 mL of growth media can be lysed in 2.0 mL of 1X Cell Extraction Buffer (recommended to supplement with protease inhibitors and additional phosphatase inhibitors as needed). NOTE: Equilibrate all materials and prepared reagents to room temperature prior to running the assay. Prepare all reagents as indicated above (Section A). Samples should be undiluted or diluted with 1X Cell Extraction Buffer to a 2X protein concentration in order to achieve a final 1X protein concentration upon addition of the antibody cocktail. Individual datasheets for each kit provide a sensitivity curve that serves as a reference for selection of an appropriate starting lysate concentration. The sensitivity curve shows typical results across a range of lysate concentration points. Add 50 μL of each sample or Positive Control to the appropriate wells. Add 50 μL of the Antibody Cocktail to each well. Seal the plate with the supplied sealing tape and incubate for 1 hour at room temperature on a plate shaker set to 400 rpm (moderate agitation). Wash 3 times* with 1X ELISA Wash Buffer, 200 μL each time for every well. After each wash, aspirate or decant from wells. Invert the plate and blot it against clean paper towels to remove the residual solution in each well, but do not allow wells to completely dry at any time. *NOTE: Certain FastScan™ ELISA Kits may require additional washes at this step. Any requirements for additional washes will be specifically noted in the product “Description” of the kit’s datasheet. Add 100 μL of TMB Substrate to each well. Seal with tape and incubate the plate in the dark for 15 min at room temperature on a plate shaker (400 rpm, moderate agitation) or alternatively for 10 min at 37°C without shaking. The FastScan™ Total Akt1 ELISA Kit is a sandwich enzyme-linked immunosorbent assay (ELISA) that detects endogenous levels of Akt1. To perform the assay, sample is incubated with a capture antibody conjugated with a proprietary tag and a second detection antibody linked to HRP, forming a sandwich with Akt1 in solution. This entire complex is immobilized to the plate via an anti-tag antibody. The wells are then washed to remove unbound material. TMB is then added. The magnitude of observed signal is proportional to the quantity of Akt1. Antibodies in kit are custom formulations specific to kit. 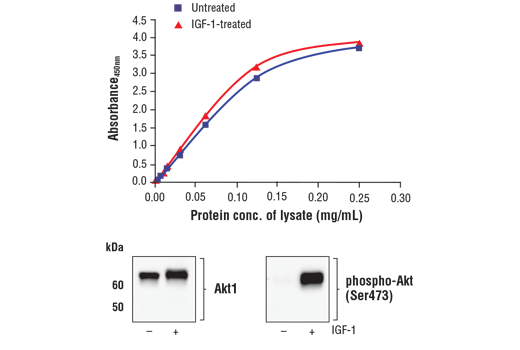 The FastScan™ Total Akt1 ELISA Kit detects endogenous levels of Akt1 as shown in Figure 1. This kit detects proteins from the indicated species, as determined through in-house testing, but may also detect homologous proteins from other species. FastScan™ ELISA is a trademark of Cell Signaling Technology, Inc.
U.S. Patents 9,086,407, 9,261,500, and 9,476,874, foreign equivalents, and child patents deriving therefrom.